I’m in the middle of a series of Cigar Spirits articles about rye, with the intention being a guide to rye along the lines of our A-Z Guide to Bourbon (part 1 and part 2). 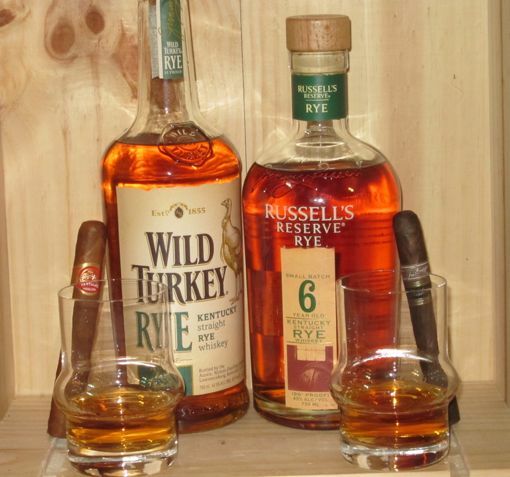 Today I’m tackling two ryes from Wild Turkey: the standard 81-proof variety, and the Russell’s Reserve Small Batch 6-Year-Old Rye. Russell’s Reserve Small Batch 6-Year Rye ($30-38) is named after Jimmy Russell (and his son Eddie), the longtime master distiller at Wild Turkey. According to the back of the bottle, it “has a crisp, lively taste that they believe to be the perfect 6-year-old rye.” The $25 81-proof standard Wild Turkey Rye is the most basic version of the Wild Turkey rye recipe, which has a mash bill of 23% corn, 65% rye, and 12% malt barley. The two represent the two easiest-to-find rye whiskeys made by Wild Turkey. Wild Turkey also sells a 101-proof rye, but it’s limited in quantity, available only in certain states, and reportedly only comes in 1-liter bottles. Along with the 101 Rye, they make for an interesting case study in the difference age and proof can make. Wild Turkey Rye 81 is a light golden color with a muted nose of floral and oak notes. On the palate it has buttery smoothness with hints of wood spice, pine, and honey. The finish is soft and short. Overall, it suffers from its diluted low-proof nature, but nevertheless is a pleasant, easy-drinking, value-priced rye. The 90-proof Russell’s Reserve Small Batch Rye has a darker copper color and an inviting nose with baking spices and wood. On the palate it’s a rounded combination of oily intensity, floral notes, and spice with hints of dried fruit. The finish is long and spicy. It’s miles more complex and interesting than it’s 81-proof cousin, a fine ribeye steak to the regular Wild Turkey 81’s burger. Both are solid pairings for a cigar, but Russell’s Reserve can stand up to a wide variety of mild, medium, or full-bodied cigars, while the standard variety is likely to be overwhelmed by a cigar that’s full-bodied. Both are good rye whiskeys, but the Small Batch variety is particularly noteworthy as a classic rye to enjoy neat.